I am not an egg lover. I have never even eaten a sample of my very own Instant Pot Boiled Eggs! From a very young age, I have never liked eggs… unless they are mixed into a sugary treat. Or a Reese’s Peanut Butter egg. Bring me a dozen of those babies any day, all. day. long! I’m not choosey, either. I’ll take a Reese’s Christmas Tree, Pumpkin, Valentine’s Heart, Big Cup, Pieces, etc. Suffice it to say, I’ll take Reese’s. When I was about 8 years old, my dad challenged me to a bet. Closing my eyes, he would feed me food with or without egg mingled in. I had to tell him whether it was present or not, white or yolk. I could tell every time. Dad: 0, Steph: 1! I just don’t care much for the taste and texture of eggs, eyes closed or open. My little boy, Brennon (shown below, 3), feels the same way. While 10 now, his opinion, like mine, has not changed: No, Thank You! My other son, Tyson, is pretty much our polar opposite, my Brennon and me. The other day, before I had fully dusted off the cobwebs of my almost-forgotten dream, Tyson approached me in glee. “Mom! I beat Dad!! Guess how many boiled eggs I had for breakfast this morning? !” Six. It is for him that I know how to make Instant Pot Boiled Eggs! Armed with your Instant Pot pressure cooker, trivet rack, 1 cup of water, and eggs, prepare to be amazed at how easy it is to pump out dozens of perfect hard boil eggs. With the stainless steel bowl inside your Instant Pot pressure cooker, pour 1 cup of water into the bottom of your bowl. Although only seven are shown, any desired amount can easily be made, no problem. Replace the lid on your Instant Pot, making sure to switch your pressure release valve to Sealing. Press Manual, using your Plus or Minus buttons to adjust the cooking time to 13 minutes. If your Instant Pot has the Low/High Pressure feature, change it to Low Pressure, for best quality. Helpful Tip: Once you start to hear pressure building, like the steam is trying to escape, place both hands on either side of the lid and quickly press downward. Don’t allow your hands to linger, since it may be pretty hot by this point, but the quick downward motion of the lid will help it seal faster. An Ice-Water Bath is used to shock the eggs after cooking– You want to stop the cooking process immediately. The longer they cook, the harder and grayer the over-cooked yolks become. This step is crucial if you want your eggs to fall out of the shell, making them easier to peel. 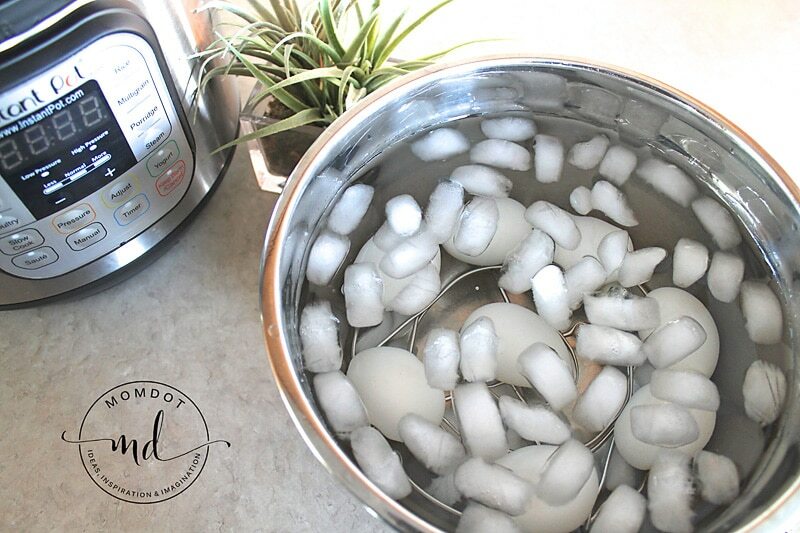 When your timer has about 2 minutes of cooking time left, start preparing your Ice-Water Bath. Fill a bowl about two-thirds full of ice water; enough to cover the eggs, but not overflow the bowl once the eggs are added. As soon as the Instant Pot pressure cooker is complete, switch your pressure release valve to Venting for a Quick Release. Make sure to always shield your skin from the escaping high pressure steam! To protect your upper cabinets from the steam, position the pressure release valve as the steam escapes away from the wood. No perfect hard-boiled egg is worth a warped cabinet! Helpful Hint: Unplug your Instant Pot for a faster Quick Release. Because my trivet rack has handles, I am able to grab the handles (with a hot pad, of course) for an easy all-at-once removal, placing the trivet rack and hard boil eggs in the bowl quickly. If your trivet rack does not have handles, grab each egg with either a hot pad or tongs, putting them in the ice water as quickly as possible. Allow your eggs to sit in the Cold Water Ice Bath for approximately 5 minutes. You want them to be cooled to the touch before placing them in the fridge. After the eggs have cooled, store them in a covered bowl (preferably one that seals) in your fridge. I have heard some say that they always peel them before they put them in the fridge because it is easier to get the peel off, but I don’t. This recipe is one that I consistently come away with two perfect halves of shell, leaving one intact, perfect egg. I have probably made more than 10 dozen batches since purchasing my Instant Pot pressure cooker in November. (It should be noted that I am new to this electric pressure cooker craze.) Using this instant pot recipe, never once have I peeled them before putting them into the fridge, or had a shell that took longer than a few seconds to peel from the egg. One quick rap on the counter, two perfect intact shells! Minutes to make, seconds to peel, less time to enjoy! All for one little 8-year-old boy named Tyson! Minutes to make, seconds to peel! Falls out of the shell!! Pour 1 Cup of Water into the bottom of your Instant Pot Bowl. Place your trivet rack into the bottom of the bowl. Position desired amount of eggs on trivet. Replace your lid, positioning your pressure release valve to Sealing. Manual, Low Pressure (if possible), 13 minutes. *Remember that additional time is needed to build pressure before the timer will begin. * Approximately 2 minutes before the cooking time expires, fill a bowl 2/3 full of ice water. Immediately switch your pressure release valve to Venting for a Quick Release, making sure to shield your skin from the steam. Quickly place eggs in Ice-water bath for approximately five minutes. Store covered in fridge. Decorating Easter Eggs is pretty much my only use for hard Boiled Eggs. 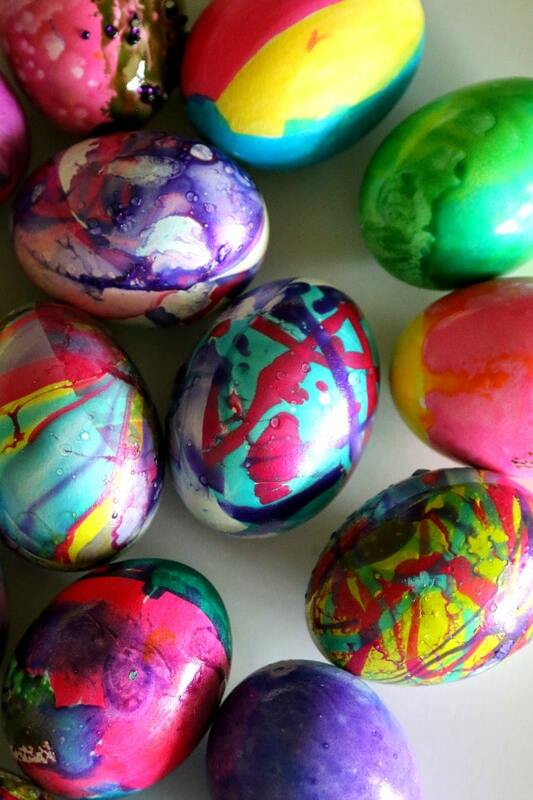 Looking for a fun way to decorate your Easter Eggs? Knowing him, he’ll love them! Mix 2 Tbsp. Sweet Relish, 2 tsp. Mustard, 2 Tbsp. Mayonnaise. He’s gone so far as to dip his egg and sprinkle it with Paprika. We’ve coined them his Lazy Deviled Eggs. Give it a try! 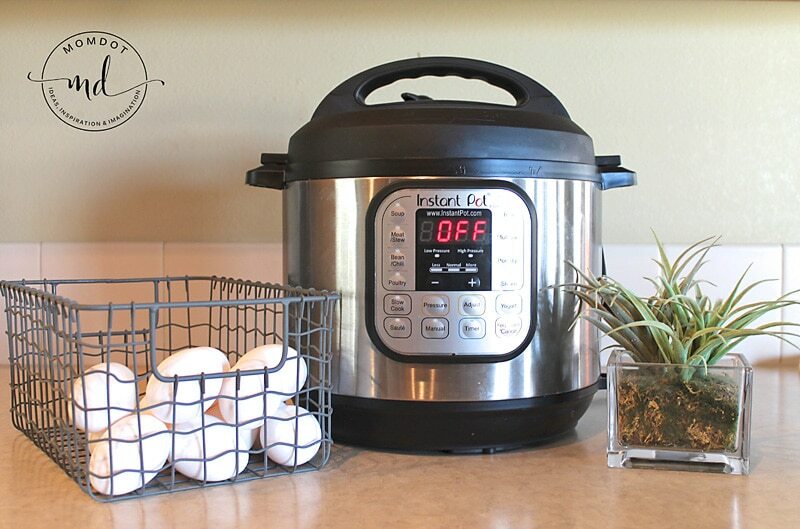 ENJOY YOUR INSTANT POT BOILED EGGS! !